Long Distance triathlete Joe Skipper (www.joeskipper.co.uk) is one of the fast improving stars of the British professional scene. 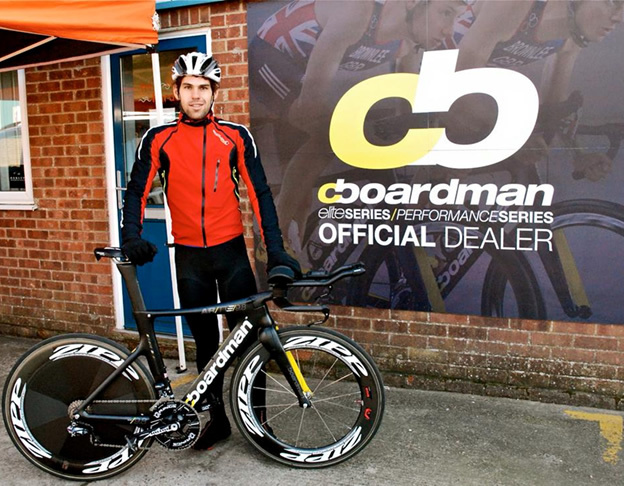 A winner at Challenge Weymouth and a close second to Kona fifth place Cyril Viennot at Ironman UK in 2014, he is already the seventh fastest British iron-distance athlete all-time, and plans to move even further up that listing in 2015. 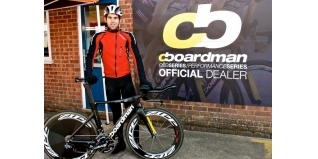 For 2015, Joe will have plenty of help to add speed to his two wheeled efforts, as he's recently collected his new sponsored Boardman AiR TTE bike. 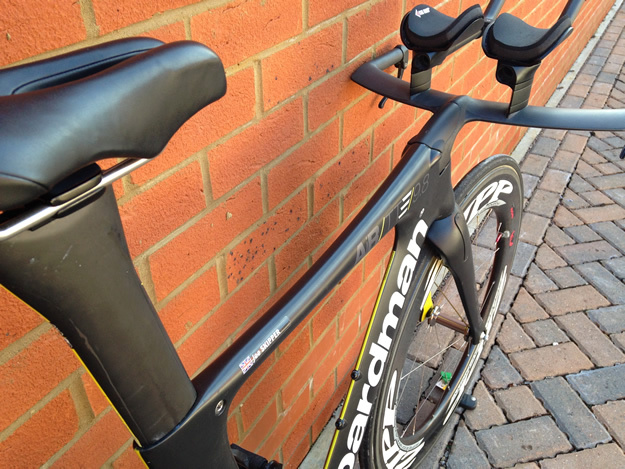 The TTE is the "flagship bike platform" from Boardman Bikes, and was launched to the world at the Ironman World Championships in Kona in 2013 - which we covered HERE. 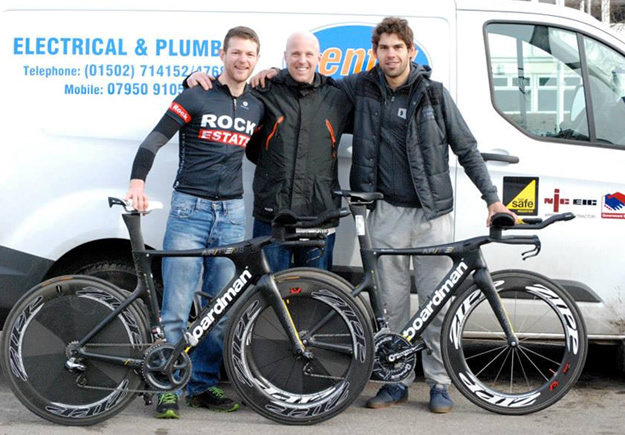 Joe picked up his new speed machine last week - and immediately put it to the test by winning the Monster Duathlon the following day. Winning on it again this coming weekend might be a somewhat tougher task... as he's taking on the cream of world triathlon at Challenge Dubai. At least he'll have one of the fastest bikes on the course on his side. Let's take a closer look at Joe's ride. Joe with training partner (and also an AiR/TTE rider), Lee Cook after they took the top two places at the Monster Duathlon last weekend. This side views shows much of the integration of both components and cabling/bolts that characterise the TTE. Hidden cables, integrated stem and handlebars, front brake integrated into the front forks. 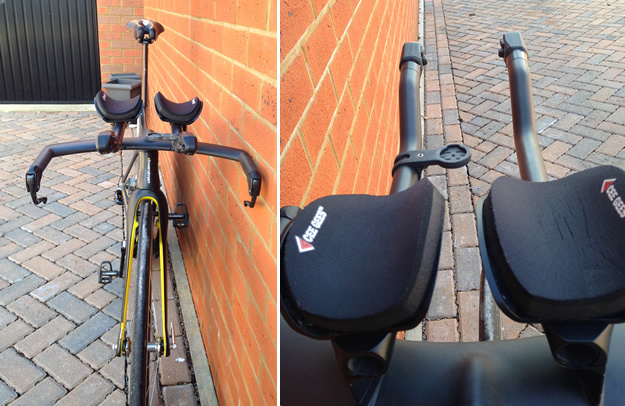 Like many athletes, Joe is using the Adamo saddle for comfort. A closer look at the integrated front brake on the TTE which is built in to the forks. 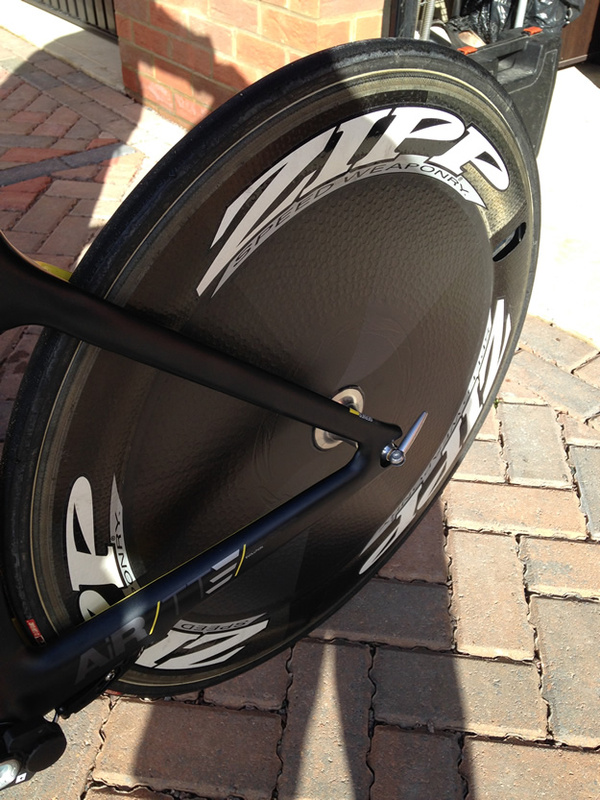 Joe uses a Zipp Firecrest 808 (Tubular) front wheel. 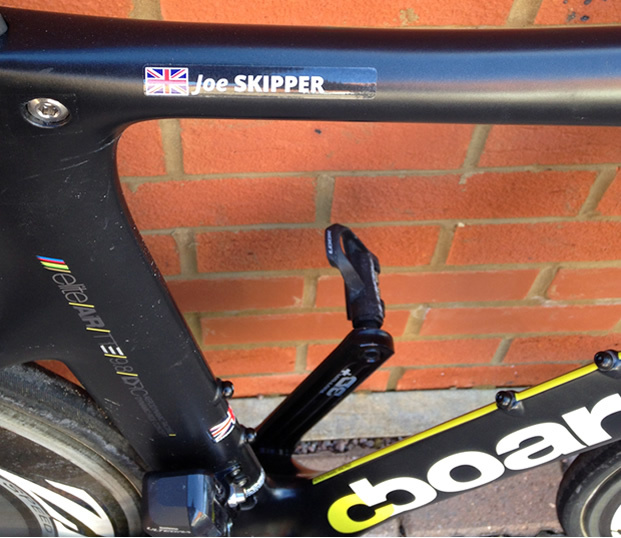 It didn't take long for Joe to get his name on this bike. We're sure it will be polished up for Friday's race in Dubai. 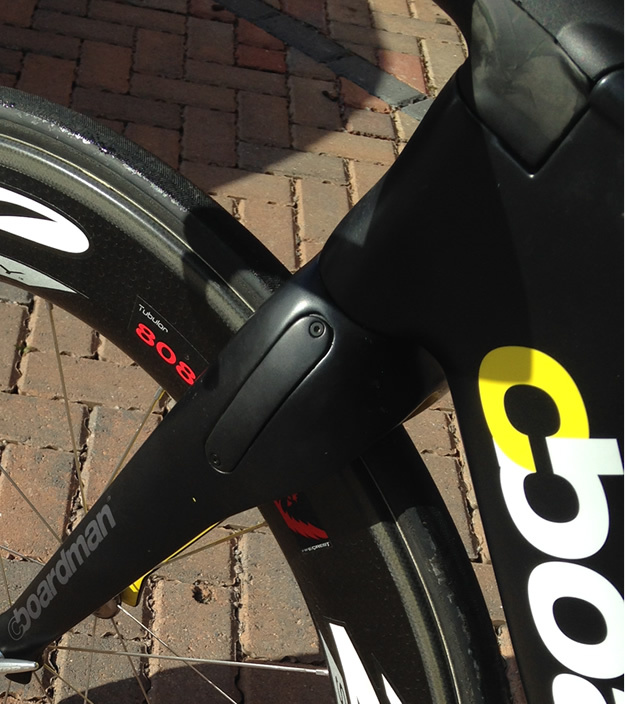 You can also see that Joe is running Shimano Ultegra Di2 (Electronic) gearing. 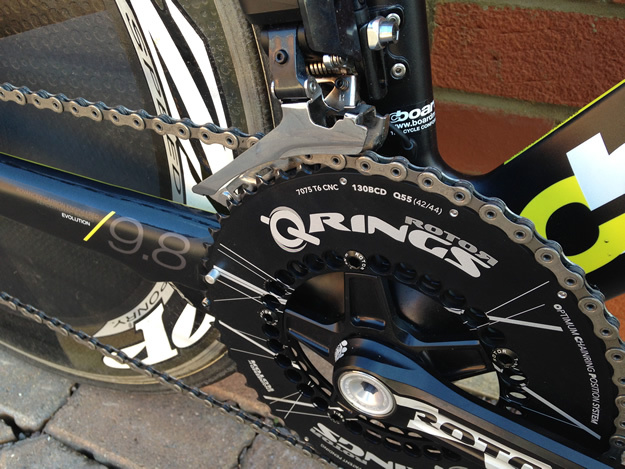 Rotor are another sponsor, and Joe is using a 55-tooth outside Q Ring on Rotor 3D+ power cranks - which will feed his power output wirelessly to his Garmin head unit. Looking back, looking forward - Joe will be resting his elbows on Cee Gees arm pads for comfort on the tri bars, with what looks like a relatively narrow arm position to improve his aerodynamics. A Zipp disc at the rear to match the front - and you can just see the bottom bracket mounted rear, integrated brake caliper too. Not surprisingly, Joe is looking quite pleased with his new addition.